This entry was posted in Uncategorized and tagged Durga, ganesha, Hinduism, Kali, practice, Shiva. Bookmark the permalink. 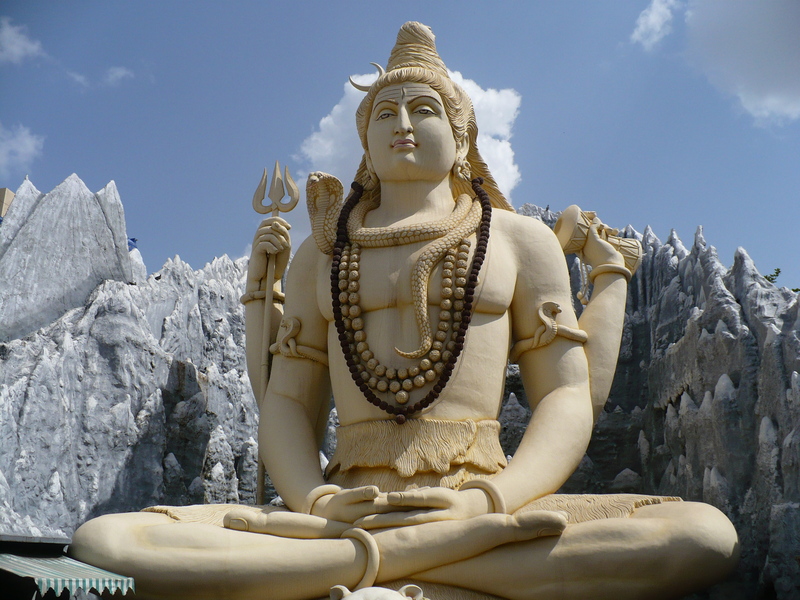 I love the Shiva murthi! Where did you find the image? I looked on wikimedia. But I’ve seen it around. It’s a huge statue in India. When I think of Shiva, this is what I think of! One stunning fact, This idol is present in the middle(probably downtown) of bangalore city adjacent to a mall. The location is called kempfort. its fascinating how you are focussing on shiva on mondays and kali on tuesdays , I believe you definitely use the “AUM” chant in meditation , Lord Shiva and the aum syllable resemble stillness , destination and stopping everything else , it is said that the whole world will submerge or converge into AUM. Kali or maa durga or the female form of god on the other hand is symbolic of movement , any micro,nano or major movement in this world , including the tap of your eyes , is a result of her blessing , so worshipping the female form , kali or maa durga , or chanting Shree will help you gain enormous amounts f energy and potential to live a life full of energy +ve growth and huge potential. In the 21st century , where most hindus r moving towards the west , materialisation and away from god , people like you are a great source f relief and prove that the Lord still dwells in even the most luxurious and earthly places :-)Hope you continue your journey towards nirvana. Beyond the rituals , i urge you to try and findout why each of those small things r done in hinduism , everythng has a meaning and a logical explanation , that will make your journey more satisfying nd deeper. Thank you for your kind words and encouragement! I am more knowledgeable of the rituals and chants than I let on. Well, as well as a Western scholar can be. Much of my knowledge is book learning only. The only way for me to internalize it is to practice. However, my practice is very, very simple, for several reasons. Firstly, I’ll admit to being rather overwhelmed with the intensity and detail of pujas, chants, etc. As a mother and homemaker I have limited time for study and practice, so I’ve chosen simple steps and only a few mantras or chants. As I gain ease and internalize the wisdom I will expand. What I find beautiful about Hinduism is that is can be incredibly simple or extremely complex and yet it is still authentic Hinduism. There is a wealth of joy in this tradition. I might go to the mall more if that was nearby….